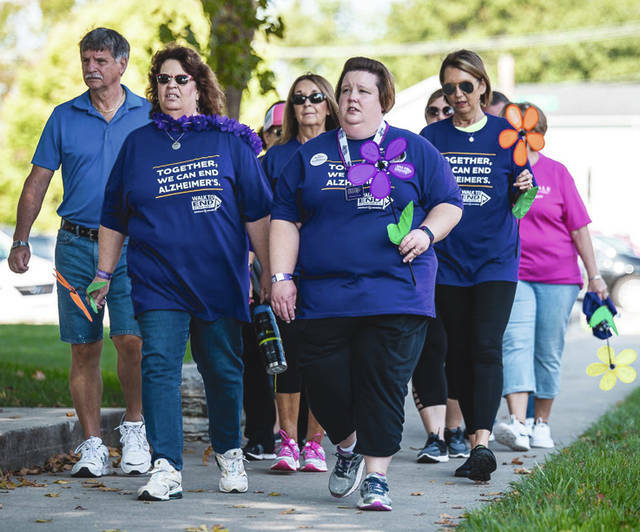 MIAMI COUNTY — Trisha Elliott of Piqua first started participating in the Miami County Walk to End Alzheimer’s as a tribute to her mother-in-law who died from Early Onset Alzheimer’s. Today, she and her husband are co-chairs of the Miami County Walk, geared to raise money for a cure. The Walk to End Alzheimer’s Miami County will take place at 10 a.m. Saturday, Sept. 15 at Troy Courthouse Square in Troy. Registration begins at 9 a.m. While at the walk, participants can learn about Alzheimer’s disease, advocacy opportunities, clinical studies enrollment and support programs and services from the Alzheimer’s Association Miami Valley Chapter. Last year, more than 500 people participated in the Miami County Walk, Elliott said. The Alzheimer’s Association Miami Valley Chapter serves nine counties, including Miami County. Last year about 30,000 people in the region were living with Alzheimer’s. Nationwide, more than 5 million Americans are living with Alzheimer’s disease, the sixth-leading cause of death in the United States and the only disease among the top 10 causes that cannot be cured, prevented or even slowed. Additionally, more than 16 million family and friends provide care to people with Alzheimer’s and other dementias in the U.S.
All funds raised through the Walk to End Alzheimer’s further the care, support and research efforts of the Alzheimer’s Association. Register today — sign up as a team captain, join a team or register to walk as an individual at alz.org/walk or call (800) 272-3900.